What Are Tefillin in Judaism? Tefillin (also called phylacteries) are two small leather boxes that contain verses from the Torah. They are worn on the head and on one arm and are held in place by leather straps. Observant men and boys who have had their Bar Mitzvah usually wear tefillin during the morning prayer services. Women do not usually wear tefillin, though this practice is changing. Why Do Some Jews Wear Tefillin? Though many have interpreted the language of this passage as a figurative reminder to always think about God, the ancient rabbis declared that these words should be taken literally. Therefore “Tie them on your hand as a sign” and “They should be on your forehead as a symbol” developed into the leather boxes (tefillin) worn on an individual's arm and head. In addition to the tefillin themselves, over time customs for how to make tefillin also evolved. Kosher tefillin must be made according to an intricate set of rules that are beyond the scope of this article. 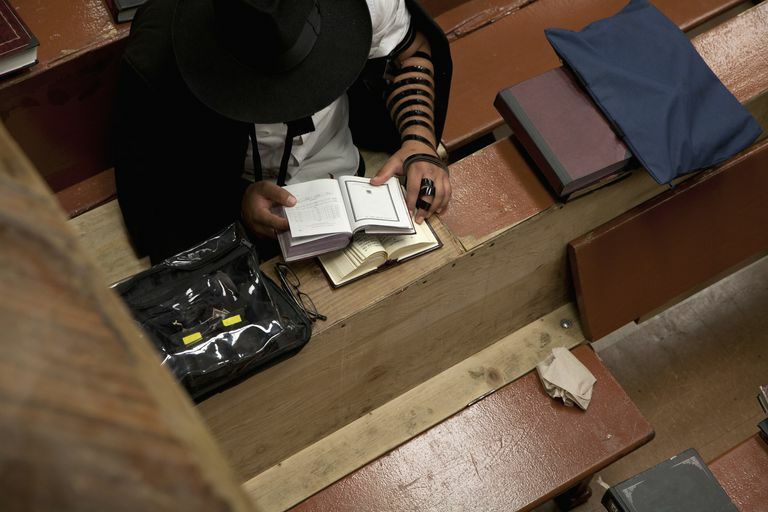 Tefillin have two leather boxes, one of which is worn on the arm and the other of which is worn on the head. If you are right-handed you should wear tefillin on the bicep of your left arm. If you are left-handed, you should wear your tefillin on the bicep of your right arm. In either case, the leather strap holding the box in place should be wrapped around the arm seven times and then six times around the fingers. There is a specific pattern to this wrapping that you should ask your rabbi or a synagogue member who wears tefillin to show you. The tefillin box worn on the head should be centered just above the forehead with the two leather straps wrapping around the head, then hanging down over the shoulders. The tefillin boxes contain verses from the Torah. Each verse is handwritten by a scribe with special ink that is used only for parchment scrolls. These passages mention the commandment to wear tefillin and are Deuteronomy 6:4-8, Deuteronomy 11:13-21, Exodus 13:1-10 and Exodus 13:11-16. Excerpts from each of these passages are quoted below.